Excuse me. Pssst. Hello? Over here! Hi! April is Distracted Driving Awareness Month. Here’s why you should care. Cambridge Mobile Telematics studied thousands of crashes and discovered that 52% of them occurred as a result of driving while distracted. Phones are one of the biggest driving distractions, according to the National Institute for Occupational Safety and Health. You already know texting and driving is incredibly dangerous, but so is using your device hands-free to make phone calls or to interact with Siri. But it’s not just cell phones that get us into trouble on the road. Drivers do all kinds of dumb stuff behind the wheel. We eat, apply makeup, fiddle with radio dials, pet the dogs riding with us and all sorts of other things that really can wait until the car is at a full stop. I spend a fair amount of time on the interstate, and I’ve seen more than one driver actually reading a book. I’m serious. If saving your own life and the lives of people around you isn’t incentive enough to stop driving while distracted, maybe staying out of jail is. Law enforcement officers from coast to coast are encouraging drivers to contact the police and rat out other drivers they see doing reckless things behind the wheel. 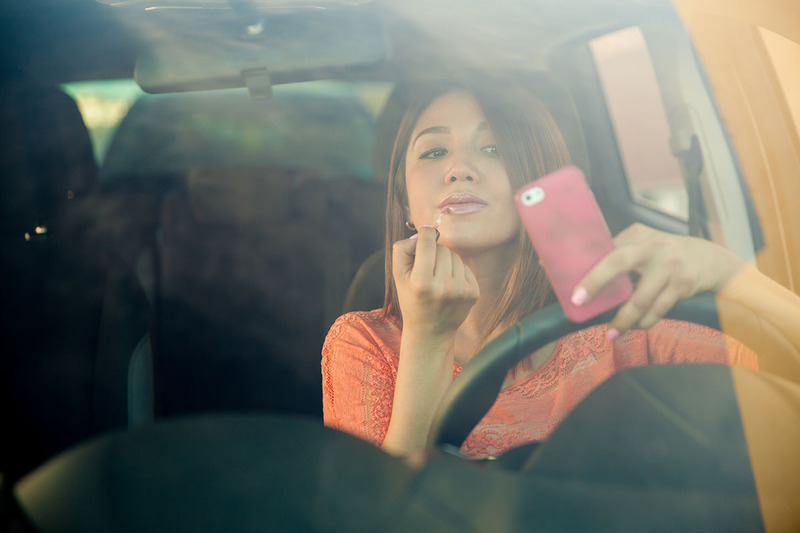 If you drive while distracted or know someone who does, it’s time to stop. The National Safety Council has a bunch of resources you can tap into to make a change or create awareness of this serious but preventable problem. Your turn: What’s the scariest thing you’ve seen someone do while driving? Lisa McGreevy is a staff writer at The Penny Hoarder. You won’t catch her texting and driving because she’s too busy singing show tunes and car seat dancing at stoplights.